This is the Terrafugia Transition, a flying car - we suppose you could call it a crossover - being shown at this year's 2012 New York International Motor Show. 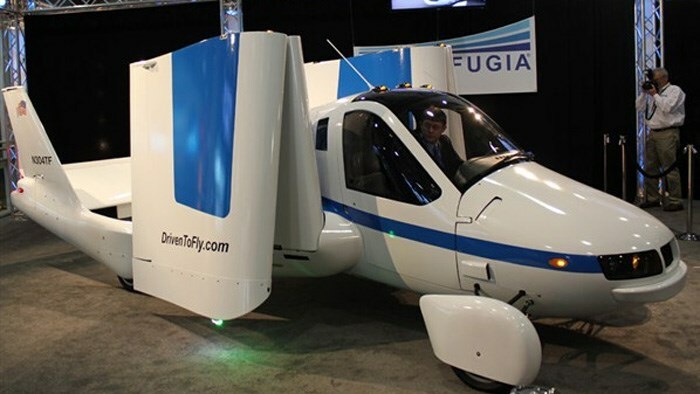 According to Terrafugia, the Transition "combines the unique convenience of being able to fold its wings, with the ability to drive on any surface road in a modern airplane platform, while offering the ability for personal flight." A 74kW Rotax engine powers the transition, with drive sent to the rear wheels via a conventional CVT gearbox, transferring to the propeller at the touch of a cockpit button. The electro-mechanical wing actuation is also controlled from inside the cockpit, taking just 30 seconds for the Transition to, er..., transition between car and plane. With only drag to hold it back, rather than friction from the road surface-tyre interaction, the Transition has a maximum velocity of 185km/h, but Terrafugia recommend a more comfortable cruising speed of 170km/h. Yes, it does work in the real world in that it can drive on the public road, but is also licenced to fly. Given the cross-concept nature of its design, it's important to stress it's a working machine. In fact, the latest incarnation of the Transition - it's a continuing development process for Terrafugia - completed an eight-minute test flight last month, flying at 1,400ft.